According to the aztecs, there were two gods who alternately crated the various humanities that have existed: Quetzalcoatl, the beneficent god, the hero-founder of agriculture and industry; and the Black Tezcatlipoca, the all-powerful, multiform, and ubiquitous god, god of darkness, patron of sorcerers and evil ones. According то the aztecs, there were two gods who alternately created the various humanities that have existed: Quetzalcoatl, the beneficent god, the hero-founder of agriculture and industry; and the Black Tezcatlipoca, the all-powerful, multiform, and ubiquitous god, god of darkness, patron of sorcerers and evil ones. The struggle of these two gods is the history of the universe; their alternating victories so many other creations. The nocturnal Tezcatlipoca, whose nahual or disguise is the jaguar, its spotted skin resembling the heavens with their myriad stars, was the first to become a sun, and with him began the first era of the world. The first men created by the gods were giants; they neither sowed grain nor tilled the soil, but lived by eating acorns and other fruits and wild roots. Tezcatlipoca was also the constellation of Ursa Major, whom the Aztecs pictured as a jaguar. While he was ruling the world as the sun, his enemy, Quetzalcoatl, struck him a blow with his staff. Tezcatlipoca fell into the water, changing into a jaguar. He devoured the giants, and the earth was depopulated and the universe was without a sun. This occurred on the day called "4 Jaguar." Then Quetzalcoatl became the sun, until the jaguar struck him down with a blow of his paw. Then a great wind arose, and all the trees were uprooted, and the greater part of mankind perished. Those men who survived were transformed into monkeys, that is, into subhuman creatures. This took place on the day "4 Wind." Men at that time ate only pine nuts, or acocentli. The creator gods then chose Tlaloc, the god of rain and celestial fire, as the sun, but Quetzalcoatl made fire rain down, and men either perished or were changed into birds. This happened on the day "4 Rain." The sustenance of men during this age was a seed called acecentli, or "water corn." 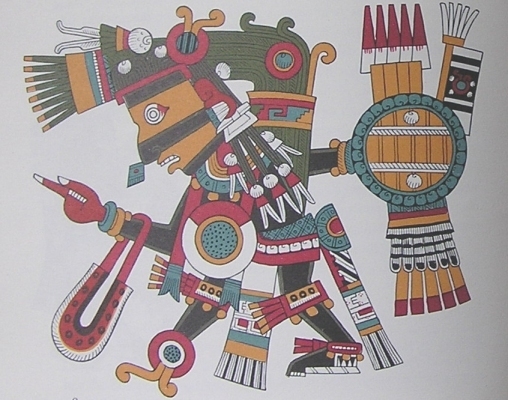 Then Quetzalcoatl selected Tlaloc's sister as the sun. She was the goddess Chalchiuhtlicue, "the lady of the jade skirts," goddess of water. But no doubt it was Tezcatlipoca who caused it to rain so hard that the earth was flooded and men either perished or were transformed into fish. This occurred on the day called "4 Water." During this age men ate cencocopi, or teocentli, the ancestor of corn. Since the sky, which is made of water, had fallen upon the earth, it was necessary for Tezcatlipoca and Quetzalcoatl to lift it up so that land might appear again. This is why, in the Codex Vienna [it is also known as the Codex Vindobonensis. 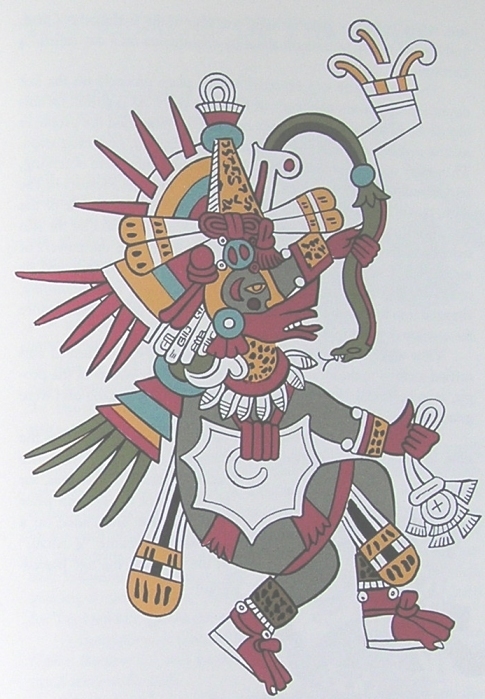 A facsimile was published by Walter Lehman and Ottokar Smital in 1929 in Vienna], Quetzalcoatl is holding up the sky with his hands. According to other traditions, the first destruction was by a flood, and men were changed into fish; the second, by fire, and men were changed into birds; the third, by wind, and men were changed into monkeys; and the fourth and last, by jaguars, who devoured the giants, thereby leaving the world depopulated. In support of these traditions there is the fact that the giants, called quinametzin, are already mentioned in historical traditions as inhabiting the earth and fighting with men, principally in the region of Tlaxcala. On the other hand, the destruction by water, fire, air, and jaguars and the conversion of human beings into fish, birds, monkeys, and giants seem to point toward a concept, not of evolution, but rather of progression, in the various creation attempts made by the gods. This idea is also found, as we shall see, in the traditions of other peoples of Mesoamerica. Just as at the first attempt humanity would be transformed into fish and at the second into birds, the third effort would also fail, but men would now be changed into monkeys. At the fourth attempt they were already men, though barbarians, for they did not sow and they lived, as tradition says, by eating acorns and roots. In the same way the different plants listed as the food of mankind continued progressively to approach the ideal foodstuff of the Meso-american, which, needless to say, is corn. Indeed, the last plant cited, the cencocopi, is none other than the teocentli, a plant similar to corn, which is generally considered to be the wild ancestor of this grass, or rather, according to the latest investigations, one of the plants which through hybridization produced present-day corn. At times only the esoteric names of the different foods of past humanities are given; thus acorns are called "7 Grass"; the acocentli, "12 Serpent"; the acecentli (milium), "4 Flower"; and the teocentli, "7 Flint"; while modern corn is called "7 Serpent." There was in the concept of multiple creations, in addition to the feeling of a divine effort which the gods destroy as imperfect, the idea that the worlds that were continually being created were gradually nearing perfection. For the Aztecs, therefore, not all past ages were the best. The golden age must not be placed at the beginning of the world, for the gods, in their continuing efforts with multiple creations, finally succeeded in finding the formula which led to the creation of a perfect humanity and a perfect foodstuff. This idea of multiple creations agrees largely with the myths that have come down to us from the Quiches, for in their sacred book, the Popol Vuh, it is related that the creator made several attempts before he achieved a perfect result. Thus the deer and the birds were created first, but since they could not lift their voices in prayer to heaven, they were condemned, and "their flesh shall be ground between the teeth." The second creation was clay men and the third, wooden men, but they had to be destroyed because they had no hearts and could not praise the gods. Only when the gods used corn seed to make the body of man could he have life, and the four men made with corn were able at last to utter words of thanks to the gods for their creation. We also find here the idea that the gods demanded constant worship from men, and that creation was not a gracious gift to man from the gods but rather in the nature of a contract carrying an obligation for man to worship the gods continually. Moreover, according to Popol Vuh, the Quiche myth, like the Aztec myth, indicates the belief that the barbarians who did not plant corn or have the organized cults of the great Central American theocracies were like poor imitations of men, that must be destroyed because the dawn of culture had not appeared to them. Further, the idea of multiple creations was, as among the Aztecs, the expression of progressive attempts made by the gods, in first creating animals and afterwards trying better and better materials until they struck upon corn, here again the divine substance of which the body of man is formed. When the last humanity of the several created previously was destroyed, whether by flood, as one of the traditions has it, or whether because the gods killed the giants, as another relates, the sun was also lost in the catastrophe, and there was no one left to light the world. Then all the gods gathered in Teotihuacan and decided that one of them should be sacrificed and changed into the sun. Two of the gods volunteered for the sacrifice. One, rich and powerful, prepared himself by offering balls of copal and liquidambar to the father of the gods, but instead of maguey spines stained with his own blood, he offered spines made of precious coral. The other god, poor and sick, could offer only balls of grass and maguey spines dyed in the blood of his own sacrifice. For four consecutive days the gods who were to undergo the trial fasted and sacrificed. On the fifth day, all the deities arranged themselves in two rows, at the end of which was placed the sacred brazier in which a great fire burned. The chosen gods must hurl themselves into the flames so that they might emerge purified to illuminate the world with their brilliance. The poor god and the rich god made ready for the trial. It fell to the lot of the rich god to make the first attempt, since he was the more powerful. Three times he lunged forward, only to stop at the edge of the great fire each time, not daring to take the final leap. The destitute god then tried his valor. Closing his eyes, he leaped into the middle of the divine brazier, which sent forth a great tongue of flame. When it died down, the rich god, shamed by his cowardice, hurled himself into the fire, and he, too, was consumed. The jaguar also leaped into the ashes, and he came out with his coat spotted; and the eagle also threw himself in, and that is why his tail-feathers and wings are black. The sacrificed gods had vanished, but still there was no sun. The other deities were troubled, wondering where it would appear. At last, out came the sun, and almost immediately thereafter the moon burst forth, shining as brightly as the sun! Enraged by the audacity of the moon, the gods struck it in the face with a rabbit, leaving a mark which it carries to this day. Thus did the Aztecs explain the spots on the moon as representing the figure of a rabbit. But the sun did not move. It hung on the horizon and seemed reluctant to start on its journey. The other gods sought the reason, and terrible was the reply. The sun demanded that the other gods, the stars, be offered in sacrifice. One of them, the planet Venus, shot an arrow at the sun to wound him, but the sun seized it and with that same arrow shot her dead; and one by one the other gods died at the hands of the sun. The twin brother of Venus, Xolotl, was the last to die. It is he who is sometimes the first and sometimes the last star to disappear among the rays of the rising sun. Since Xolotl, in addition to being the god of twins and of monsters, was also a very clever sorcerer, his death was not easy to accomplish. He changed himself first into double maguey, called mexolotl, and then into double corn, then into many other double things or monstrosities, and finally, into the axolotl, or "ajolote" (the salamander), which lives in water, and it was there that the sun killed him. In the Aztec myth of the creation of the suns there is a facet which we do not find in the Quiche book; namely, the belief that this fifth sun, which currently gives us light, was also to die as the others died, and his end would be brought about by earthquakes on a day called "4 Earthquake." This catastrophe was expected to take place precisely on the last day of an Aztec century, a cycle of fifty-two years. At nightfall on this day all the fires in the city were put out, and the priests led the people in solemn procession to a temple atop the Hill of the Star, near Ixtapalapa. There they waited until midnight, and if the star they were observing, undoubtedly Aldebaran, either in conjunction with the Pleiades or the Ram, passed in his course over what they considered the middle of the sky, it meant that the world would not come to an end and that the sun would rise the following day to renew his struggle with the powers of night. But if Aldebaran, called Yohualtecuhtli, had not followed its course on that night, then the stars and the planets, the tzitzimime, changed into fearful beasts, must return to earth, to devour man before the earthquakes destroyed the sun. Thus when Aldebaran passed the meridian, fire was kindled and carried joyfully to the local temples and thence to the homes of the people, as an indication that the gods had taken pity on mankind and were granting men another century of life. It should be noted that the end of each epoch, in the legend of the suns, fell on a day that carried the numeral 4. The same circumstance occurred among the Mayas, for in their count the age just prior to the present one ended on a day with the name "4 Ahau," as likewise had the age preceding it.